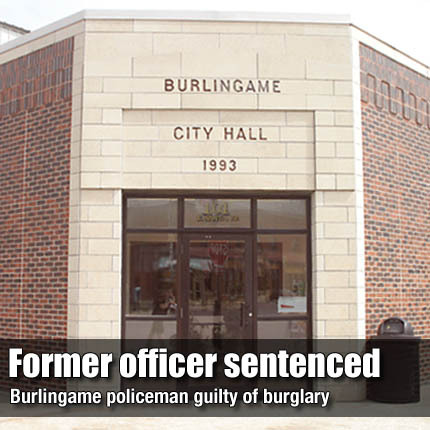 LYNDON—A former Burlingame police officer was sentenced Tuesday following a guilty verdict in Osage County District Court. Osage County Attorney Brandon Jones released a statement concerning Anthony D. Richman, 39, of Burlingame, who was found guilty of residential burglary, a level 7 person felony, on Nov. 29. Richman received a suspended sentence of 12 months in prison Tuesday, and 24 months of supervised probation. He was also ordered to successfully complete a theft offender program and pay $275 in restitution to the city of Burlingame for fuel that was taken without authorization. Richman was suspended without pay by the Burlingame City Council on May 20, and was charged with two counts of felony residential burglary, one count of criminal trespass, and 12 counts of misdemeanor theft on May 25. Richman resigned June 6 as a part-time officer, and was arrested June 7 by the Osage County Sheriff’s Office. He worked as a part-time officer for the Burlingame Police Department periodically between 2004 and 2011.